Social Multiplier 2 has now closed. Links below dont work, but see our latest blog post to see how you can still get access at an even better price! Jonathan Leger, the creator of an amazing new tool called Social Multiplier. He uses this tool to generate massive amounts of traffic from Pinterest to his network of websites. In JUST 17 DAYS he was able to generate 308,472 visitors from Pinterest. close midnight PST this Friday. So you better get your copy immediately. The best deal is the lifetime option which you can see here. But before you buy there is one major flaw that is not covered by the software but is easily fixed. 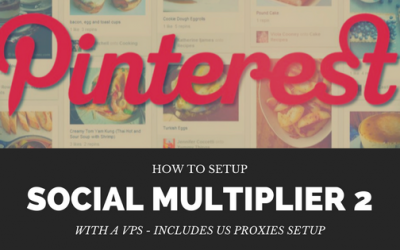 - Pinterest gets 10s of millions of visitors a week (Social Multiplier sends them to your site)! - 93% of Pinterest users go there to plan purchases (have them plan to purchase from you)! - Pinterest has the highest per-sale value of any social network ($50+ per sale could be yours)! - 34% of Pinterest users have a household income of $75,000 USD or higher, and 68% have $50,000 USD or higher (money that could be spent on your site)! - More than 100 million members of Pinterest are from the United States! Social Multiplier makes it easy to start getting traffic from Pinterest, often in the first 24 hours of using it. Check out the sales page to see all of the proof and watch the short video showing how it generated more than 100 unique visitors in its first day on a brand new site! Get your copy of Social Multiplier 2 here before the sales page goes down in the next few days! Last edited on 1st Nov 2016 at 06:13 PM. Pinterest. I am going to need this but not for 2 months or so. can i get it from you then? send a link to the video. i could not locate it. Hi Marketing Pro yes you will be able to get it then - just not with this current link as that sale has now ended. Jonathan Leger is trying to legitimately limit access to this tool as its so powerful. I'm using it and loving it and going to be creating 5 new sites immediately to utilize its viral effect. I am writing a new post that shows how to get access to Social Multiplier 2 even cheaper using one of our discount codes. I will update this thread once it is done. I have now added that post showing how you can still get access to Social Multiplier 2 even after it has now closed. Plus I show a way you can get it for either $62 p/m or $24.33 p/m (depending on your payment plan) which is way cheaper than the price of $97 per month they were charging at launch.